Now I can share my ugly fabric challenge quilt. You can see other pictures and information about it here. 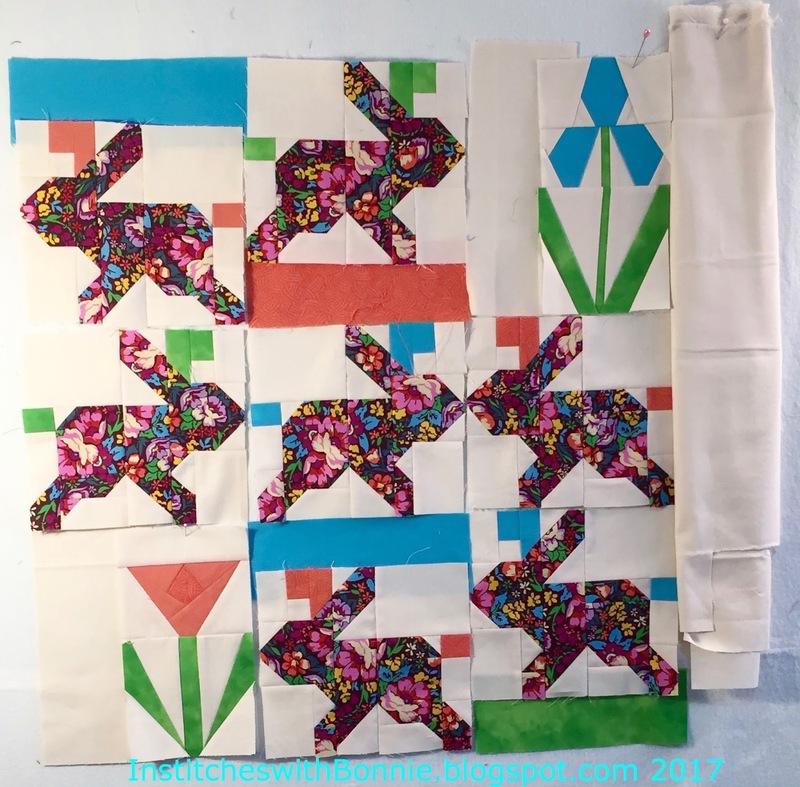 The first picture is when I was trying to decide whether to leave space between the flowers and the bunnies and what to do about a border. The rules of the challenge said 20" minimum. I didn't want a huge piece so a small border is all I did. And the best news was I was done before I needed it. (Ok, so many readers know I was done early because I thought the guild meeting was a week earlier than it really was.) Now the bunnies are hanging on a wall in our great room. Unfortunately, there are windows on both sides of the wall and the lighting was too bright today so the quilt looks a little washed out. I used the ugly flower print for the binding too. Unfortunately I believed the rule that said not to use the ugly fabric on the back. I would have been happy to get rid use up all of it that way. See if I follow the rules next time! That brings me to my goals for last week. It was a very good week for ticking things off of my list. I'm especially happy I finished cutting out over 425 4.5" squares. Thank goodness for my Go cutter -- I could cut 6 squares at a time. And this week I'm on retreat so everything has to do with it. I'm connecting up with Monday Making, Main Crush Monday (now back to the right day!) and Moving It Forward Monday. Enjoy the eye candy folks! I plan to! I'm linking this post to the May finishes linky party on Elm Street Quilts. Yep, I finished my goal really early this month. Maybe I can do the same next month! No duck photos today but they continue to hang around under the bird feeders on our block. One was calmly sitting in the middle of road as we came home this morning. They may be getting too used to the people around here! P.S. I'm here from Main Crush Mondays! Your bunnies turned out nicely. I especially like the iris. Indeed -- enjoy the retreat! Love the bunnies. Next time you can do ducks! Nice job! I think the bunnies are pretty cute. Great job on meeting all your goals last week. I doubt I would use a GO enough to justify the purchase, but yours certainly came in handy with the 4.5 in h squares. Making the bunnies with the 'ugly' fabric was a great idea - the focus is on the bunnies and not the fabric. I've got some ugly fabric and you've given me an idea for how I can use it. 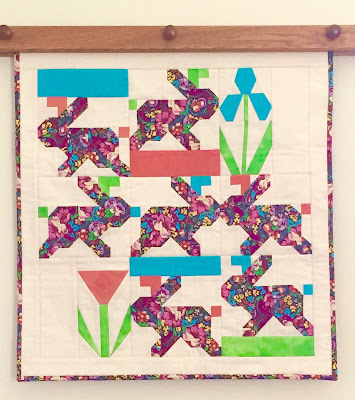 :) I think your quilt is adorable and those bunnies are soooo sweet! Thanks for linking them to MCM! A fun challenge quilt. Your ugly fabric made for some very colorful rabbits. Great challenge quilt. Thanks for linking up with Elm Street Quilts One Monthly Goal and congrats on your finish.